Former Angoon Democratic Senator Albert Kookesh discusses issues in his office. (CoastAlaska Photo/Ed Schoenfeld. An Alaska Native leader and former lawmaker remained in the hospital today (Tue 2-19-13) after suffering a heart attack Monday in Juneau. Providence Alaska Medical Center in Anchorage listed Albert Kookesh in critical condition as of late afternoon. Kookesh co-chairs the Alaska Federation of Natives and chairs the Sealaska regional corporation’s board of directors. His family could not be reached for immediate comment. But Sealaska posted an update on its website saying he is resting after undergoing surgery to correct a blockage. The update says doctors plan to wake him up from sedation Wednesday. It says his family asked that no flowers be sent because Kookesh is allergic. The Angoon Democrat served eight years in the House and eight years in the Senate. He lost a re-election bid last year after redistricting separated him from many of the communities he represented. 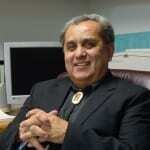 Kookesh has also been involved in a number of regional and nationwide Alaska Native organizations. He has a law degree and has been a seiner and a store- and lodge-owner. In a recent interview, he said he was contemplating rejoining the fishing fleet.